NOT: Aşağıda verilen test eski müfredata aittir. Yeni müfredata uygun testler için İngilizce Testleri sayfamızı ziyaret ediniz. Cenk : Have you washed the dishes ...................? Merve : No, I haven’t. I’ll wash them after I clean the floor. A : Can you take the dog for a walk, please? B : .................................. . I’m very tired. C)	That’s a great idea. D)	I’m sorry, I can’t. I have already done the washing up and the laundry, ............... I haven’t vacuumed the floor yet. Betty : Will you help me in doing the housework, please? Betty : Thank you very much, Sarah. My husband is very ....................... . He never helps me with the housework. He always says he is tired. Jerry : ................... you help me with my homework? Kate : I’m sorry, I can’t. I’m not good at Maths. I did all the housework by myself. It was a very ................... day for me. According to the studies, smoking .................... the risk of heart attacks and cancer. 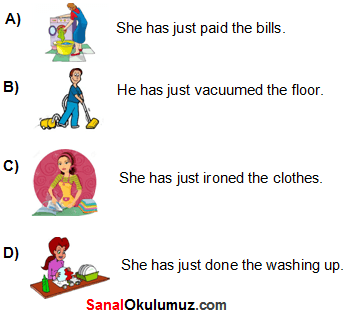 Masid : What kind of housework do you like doing most? Wendy : I like ............................ because I love animals a lot. I am late for school. I must dress up and leave the house ...................... .
Aşağıdaki resim cümle eşleştirmelerinden hangisi yanlıştır? I left the cinema in the middle of the film because it was so ....................... .
..........................., so I can’t go out now. Yukarıdaki tabloya göre aşağıdaki cümlelerden hangisi doğrudur? A)	Ken has already done the washing up. B)	Cindy has alrady taken the rubbish out, but she hasn’t done the laundry yet. C)	Ken hasn’t taken the rubbish out or done the laundry yet. D)	Mary has already done the washing up, but she hasn’t done the laundry yet. He is a .................... singer. He sings very ................. .